New Nigerian President Muhammadu Buhari promised on Friday to eradicate the “mindless, godless” militants of Boko Haram and rescue hundreds of women and children held captive, including 200 girls taken from the town of Chibok a year ago. In his inaugural address as elected leader of Africa’s most populous nation and biggest oil producer, Buhari also painted a picture of an economy in crisis after a collapse in the price of crude, which accounts for the bulk of state revenue. “The armed forces will be fully charged with prosecuting the fight against Boko Haram,” the 72-year-old former military ruler announced. A Muslim, he said the group was “as far from Islam as one can think of”. Neighbouring Chad said its army had killed at least 33 Boko Haram militants and lost three of its own soldiers in heavy fighting on an island in Lake Chad on Wednesday. Friday’s handover, following Buhari’s election victory in March, was Nigeria’s first democratic transfer of power. He inherits a host of problems from his predecessor Goodluck Jonathan, whose five-year tenure was marked by aimless security and foreign policy-making, as well as corruption scandals. Depleted foreign reserves, vastly reduced oil revenues, corruption and the escalating cost of servicing debt had left the economy in “deep trouble”, Buhari said. He made no mention of the naira currency, which economists say may be heading for another devaluation. Importantly, he held out an olive branch to his political opponents in the oil-producing Niger Delta, saying his administration would continue to invest heavily in projects in the region that have underpinned an amnesty for militant groups there. 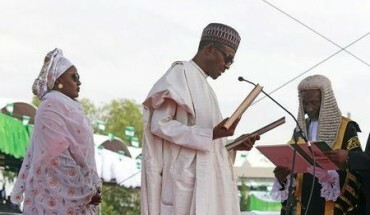 Three decades after he first came to power in a military coup, Buhari’s swearing-in marks a remarkable turn-around from authoritarian ruler to democrat following his landslide victory. His oath was followed by the release of dozens of white doves, symbolising peace. Many of Nigeria’s 170 million people interpreted it as turning the page on five years of disappointment and frustration under Jonathan. “Jonathan was so bad, very bad. Now the incoming president will do something for us,” said Mutawali Bukar, a businessman from the northeast city of Maiduguri, the centre of the Boko Haram insurgency. Thousands in Abuja’s Eagle Square chanted “Sai Buhari”, which means “All hail, Buhari” in the northern Hausa language. The optimism is, however, tempered by the reality in which Nigeria finds itself. Much depends on Buhari’s choice of ministers, particularly in portfolios such as finance, internal security and oil. Yemi Osinbajo, a Christian lawyer from the southwest region that includes Lagos, is vice-president, a deliberate counterweight in the religiously mixed nation to Buhari, who is from the predominantly Muslim north. Befitting Buhari’s modest style, there was little fanfare in Abuja before his swearing-in, with security checkpoints leading to Eagle Square and a few green and white national flags lining its main expressway. The ceremony was attended by African leaders and foreign dignitaries including U.S. Secretary of State John Kerry. A senior U.S. official said Washington, which had strained ties with Jonathan’s administration, was ready to expand military cooperation, including sending advisers to help train Nigeria’s army against Boko Haram. “We have every indication that we’ll be able to start a new chapter,” the official said. British Foreign Secretary Philip Hammond said London also aimed to increase its support, including in the area of intelligence. “We’ve asked the president, when he’s ready, to let us have a shopping list of the support that he wants,” Hammond said. South African President Jacob Zuma was a notable guest, a sign of Pretoria’s desire to improve relations with Abuja after a series of diplomatic rows, most recently over a wave of attacks on foreigners in South Africa this year.